Have you ever caught the passing hint of fragrance someone happens to be wearing as they walk by you? People say the sense of smell is the strongest sense tied to memory. Scents can portray playfulness, mystique, romance, and more. Fragrances possess so much influence in how we are remembered and how we spring back to someone's mind if a whiff of our favorite scents happens to come along again. Calvin Klein Euphoria Fragrance for Women makes very sure that your scent is as enchanting as it is unforgettable. 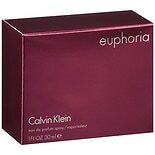 The Calvin Klein Euphoria perfume or Women evokes feelings of mystery, provocation, seduction, and excitement. This alluring fragrance draws out the wonder in those around you, hinting at fantasy and surprise. The black orchid captivates the senses with a scent that lingers beautifully for hours. Euphoria fragrance joins together exotic fruits with seductive floral notes to create an irresistible aroma that represents oriental beauty. This fragrance creates a woodsy, floral entrance as you enter the room. The top notes embrace pomegranate, persimmon, and lush green notes. The mid notes follow in exotic manner with lotus blossom, champaca flower, and black orchid. The end notes bring everything together in a grand finale with liquid amber, black violet, cream accord, and mahogany. It is lightly musky with a warm and sensuous aura. The fragrance as a whole is sophisticated and sultry, ready to take on your most amorous adventures or even your most relaxing moments. Euphoria fragrance invites seduction, temptation, and mystery into your life. You can easily let go of the mundane, everyday happenings, making room for fantasy, excitement, and true sexiness. By definition, euphoria is described as a feeling of intense happiness or excitement, a sense of joy or elation. These emotions carry over from the fragrance itself to your own mood, even inspiring the senses of those around you. This scent packs a powerful punch for an exhilarating evening on the town. Some women say this is the only fragrance they will ever wear.